Can you believe? : Where should we meet? completely new meetinghouse was built on Chester Blvd. Photos from Lost Richmond, Morrisson-Reeves Library. Robert Powers' article, "Reuse or Replace: What Becomes of Religious Structures When Congregations Move On? ", begins with these words: "In late December, the City of Chicago issued an emergency demolition permit for the Anshe Kenesseth Israel building, a grandiose former synagogue in the city's downtrodden west side." 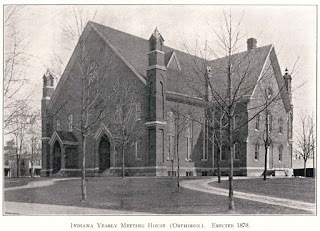 The article brought back wistful memories of our old Quaker meetinghouse on East Main Street, Richmond, Indiana, USA, between 15th and 16th Streets--now site of CVS Pharmacy and Family Video stores. The case of First Friends isn't a perfect match for the Powers article--it was a fatal defect in the church's structure which spelled the end for our building--but I was fascinated by the role of CVS in reusing a couple of other church properties. And, in the long term, we probably would have faced some of the same dilemmas. I remember long discussions in business meetings concerning the Trustees' battles in maintaining and heating that huge old building when our congregation had shrunk from 1500 to 300 (and attendance far less than that) in a couple of generations. After yet another expensive re-roofing project was approved, one of our members said, "This is the last time I'm going to approve re-roofing this museum," or words to that effect. When a city inspector told us that part of the roof structure had begun separating as a result of decay combined with winter stresses (and, if I remember correctly, a less than perfect joint between the original building and a large addition build early in the 20th century), we knew we were facing a crisis. First of all, the inspector (from a family associated with the meeting!) required that we no longer meet in the beautiful main meeting room. This room was the spiritual living room for generations--including our own kids. I have wonderful memories of our kids crawling around under the pews. For them, this awesome hall was their home, where they felt perfectly comfortable to be themselves. (Such an amazing sight to behold for me, the son of atheists, who had absolutely zero childhood church-related memories.) The room had been used for plenary gatherings of the Five Years Meeting, later called Friends United Meeting. Billy Sunday preached there in 1926. The Richmond Symphony Orchestra played concerts there. Life-changing ministry happened in that room, including the memorial meeting for my sister Ellen, nearly twenty years after her murder. In Russian terms, it was a "намоленное место"--a place made powerful by heartfelt prayer. We sadly obeyed the city inspector and moved our worship meetings to the library. Much of the rest of the building could still be used for the time being, including its twenty or more small-group rooms, three kitchens, huge basement dining room, and the coffee-shop and food-pantry facilities. At first we considered erecting a series of pillars and huge beams to support the ceiling while mostly preserving the architecture and interior. In the meantime, local preservationists caught wind of the danger our building was in, and pleaded with us to preserve the building. But when we saw the price tag for preservation, it was as much as building a new meetinghouse, if not more. We had to come to the realization that, if we were to keep our beloved building, most of our strength as a congregation would be sunk into maintenance and architectural preservation instead of spiritual growth and outreach. 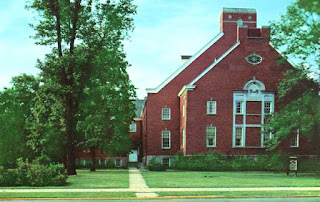 Our actual congregational life was incredibly portable--we could rent a movie theater or a school, for example--but we knew that if we sold the property, our building was doomed, and that prospect was just plain hard. On balance, I think we were right to choose the path we chose: to build a new meetinghouse on land owned by the Yearly Meeting in the north end of Richmond, and to use volunteer labor from the meeting itself as much as possible in construction, to save cost. The architect for the new building, Jack Hodell, had worked earlier with Earlham College and Richmond's Morrisson-Reeves Library, and he created a design that was in harmony with the nearby Friends Fellowship Community building on the same property. The building itself is simple and its interior space adaptable. It would have been impossible to replace the huge Quaker cathedral on East Main, and in any case that sort of grandiosity would not have reflected who we were. The more "portable" alternatives, such as renting a theater or breaking up into a number of house churches, also would not have reflected who we were at that time. 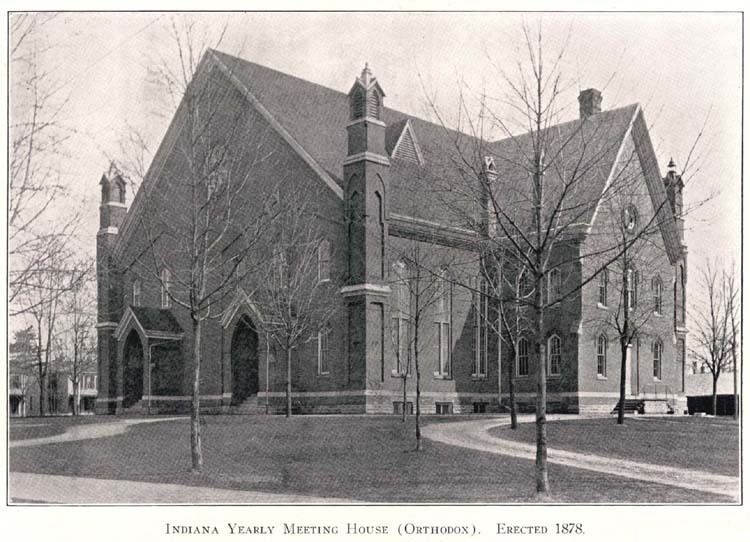 In the early 1980's, several local Friends from all the existing Quaker meetings of Richmond, Indiana, actively talked about starting a new meeting along conservative (Ohio Yearly Meeting) lines, and that probably would have been a home-based congregation. Instead, we continued to stay with our own meeting, honoring the many ways they loved us even as we chafed under what sometimes seemed to us as excessive traditionalism and respectability. For all those seeming defects, when the crisis came, I believe we emerged stronger. That old building, now gone, still reflects part of our historic identity, but no longer controls our future. Last month, recent works by the dean of our institute's design faculty, Tatiana Vilde, were on display at the Lubr gallery in Elektrostal. She called the exhibition "Summer in Wintertime" (Зимою--лето: if someone has a better translation, let me know!) Some examples. Another fascinating article related to architecture and preservation came out just yesterday: "Roosevelt University's Towering Ambition." The personal connection for me is this: through most of my childhood, my mother taught at Roosevelt. Thanks to her, I remember the amazing Auditorium Building where she taught. It sounds like this new building is a scary gamble--I hope it turns out well. And while I'm thinking about the nature of church (building, community, or institution? ), here's a reflection on the recent U.S. Supreme Court Hosanna-Tabor decision. "Rethinking secularism: 'The Church'." Alex Kane: Friend Helena Cobban and an attempt to discredit her. "The Heart and Soul of the late Etta James."